The Howling Dog Alaska Second Skin Harness is the newest addition to K9 Trail Time’s ever expanding range of sport dog harnesses and so I have chosen to write a short blog on it, as many people have been asking me about its’ pros and cons. Firstly, I love the material it’s made from, it’s made from really soft, mesh material and is very comfy for the dog from the outset. It has a rounded neck hole which slips over the dogs’ head and then with just one leg to be pulled through on the left side, the right has a plastic clip to do up, which makes the rib strap adjustable. Donnie wears a size small and this is the smallest size available because it is designed and made in America to be used for sled dogs and therefore smaller dogs weren’t considered. The harness has two attachment points which could be used but the line is supposed to be clipped to the cord as shown in the picture above. I have real problems finding harnesses which do not ride up into Donnie’s throat and cause him to wheeze and the Second Skin harness is one of only two which I have found that don’t do this to some extent on him. I think because the material is so soft, it allows the dog to really pull into the harness without restriction and he certainly seems comfortable in it. 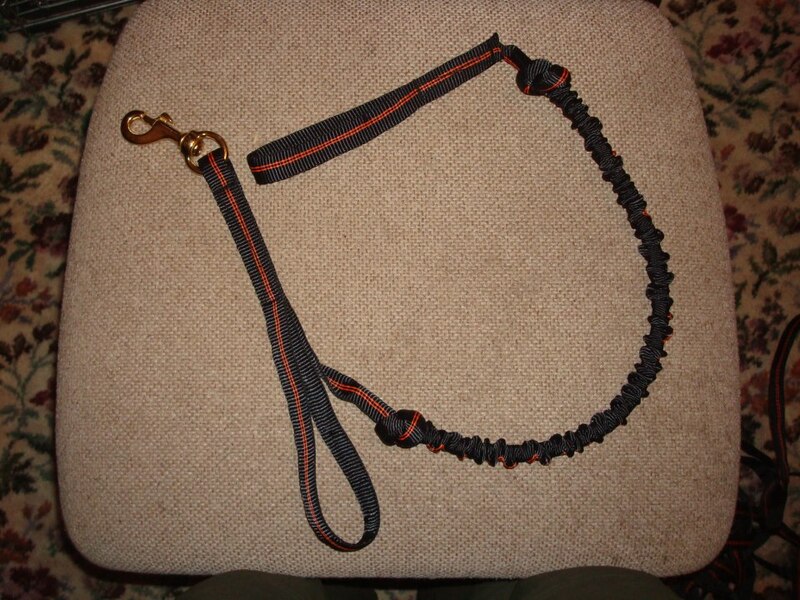 The drawbacks of this harness are that your dog must pull out in front constantly or the harness will slip to one side. 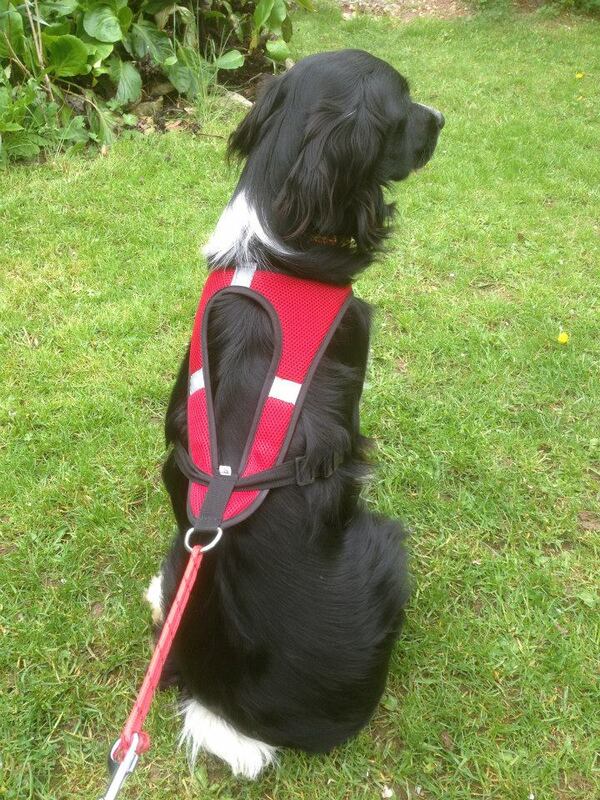 It is not designed to be used for ‘dawdling’ dogs and in that respect is very much a sport harness. I have also noticed the material does seem to cover the shoulder more than other harnesses but have to say this has made no difference to the way Donnie runs in it and it doesn’t seem to be an issue. One last very positive thing about this harness (particularly from my point of view owning a Sprollie) is that the harness is very lightweight and quick drying. So when Donnie has a quick dip after, or during runs, it quickly dries out and there is no fear of it rubbing or causing him any problems when wet. 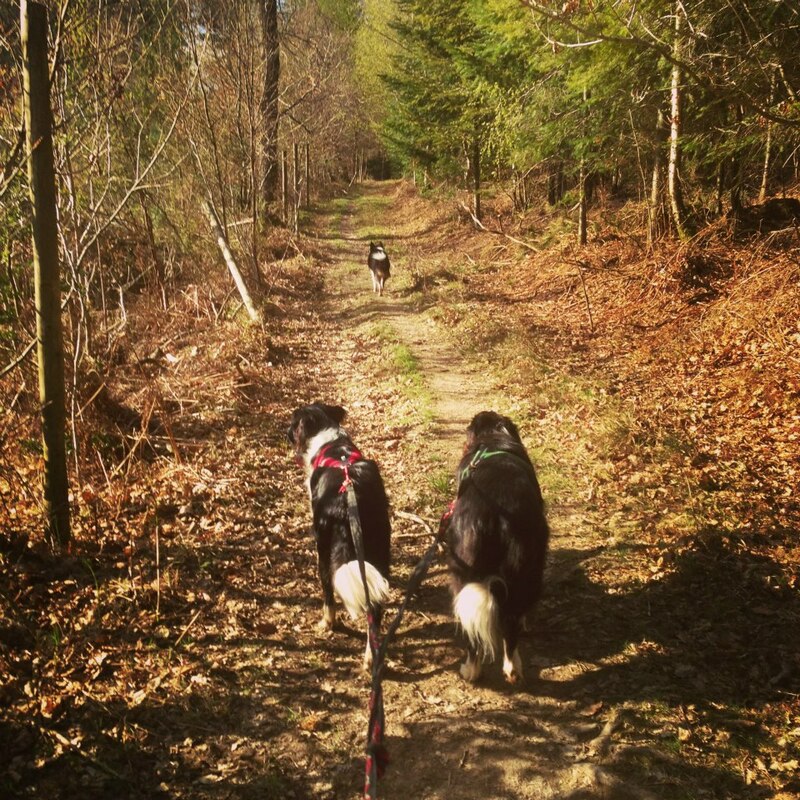 With the warmer months upon (some) of us, I thought it would be a good idea to list our top tips for summer canicrossing, as I know many people feel they shouldn’t be running their dogs in harness in summer. There can always be the risk of your dog overheating in the warmth of June, July and August but the British summer never quite lives up to expectations, so you can often continue your training by heeding a few simple things. – Always carry water – even if you don’t think your dog will need a drink, it is always safer to carry water if you are not sure of natural water sources on your route. You may be caught out with the warmth in woods and shaded areas where you might think it would be cooler and so it always better to be safe than sorry. Collapsible water bowls are available in most good pet shops and fold into pockets or can be attached to canicross belts. It is important to note that your dog should not be allowed to gulp large quantities of water, as this can cause bloat in dogs and if your dog is feeling the need to take on that much water then it is too hot to be running them! – Always check both the temperature and humidity before you leave for your run – there are many free apps for smart phones now which give you both the expected temperature and humidity. Never under-estimate the effect humidity can have on your dog. As a general rule sled dogs don’t run in temperatures above 15 degrees centigrade but your dogs’ tolerance of this could be much lower if the humidity is high. If in doubt don’t run. – Keep runs shorter and slower than you might normally train at – although you want to keep up your fitness, don’t use the summer months to start sprint training or increase your distances, as this is the time when your dog may need to be doing less, either to recover from the racing season or because of higher temperatures which can cause your dog to over exert himself/herself. Also be aware that a race situation will put more stress on a dog and make it more liable to overheat than a jog around your local park with some friends might. – Invest in a sprinkler/hoselock/cooler jacket for your dog – although not necessary if you closely monitor your dog and never run in temperatures that exceed your dogs’ comfort zone, a hand held plant sprayer filled with water or a hoselock system in the car, can help cool a dog down quickly without shocking the dogs’ system. Cool coats and jackets claim to do a similar thing but must remain wet to help in cooling your dog down and the usefulness of these jackets on double coated dogs has been debated. – Check your dogs’ paws regularly for cracks and damage – as we don’t get an awful lot of snow in the UK, many dog owners find they have more problems with their dogs paws in the summer months than the winter. Keep an eye on your dogs’ pads for signs of wear and tear and if you experience problems look into paw wax or boots (which shouldn’t be used extensively in warm weather as dogs lose heat through their paws) to help prevent cracking. – Keep your runs to unsociable hours – you might not like getting up at 5am to get your dog out for a canicross run but your dog will thank you. Not only will the temperatures be cooler at this time but you will also enjoy the additional wildlife you will probably see on these runs! Equally running at night after dusk will help avoid the higher temperatures although it does take a while to cool down after a warm day, so aim to be out just before it gets dark. 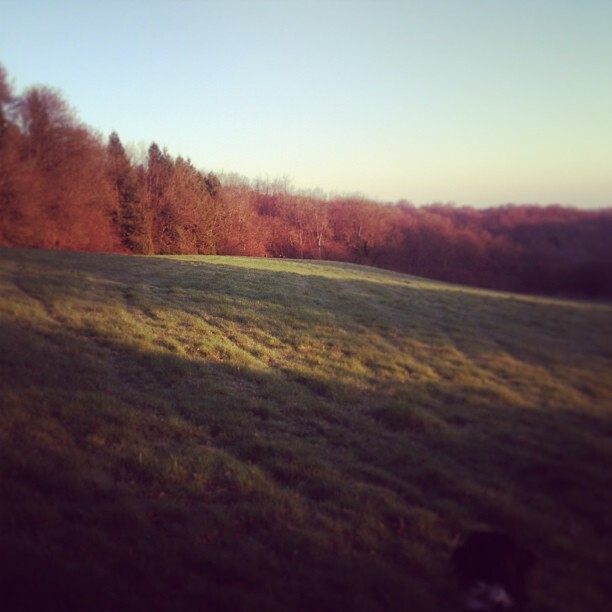 Early morning runs can be the best for your dogs and for wildlife spotting! If you avoid the heat of the day, always carry water, always check the temperature and humidity before runs, keep them short, slow and monitor your dog at all times for signs of heat stroke, you should be fine to continue with some summer training. 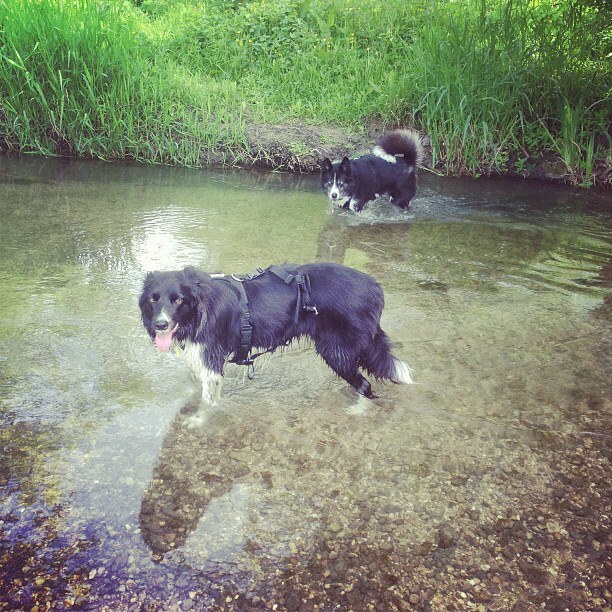 The main thing for you to remember is that every dog is an individual and so if your dog appears to be struggling, whatever the temperature or humidity might be, don’t push your dog and accept you may be running solo through the summer. It won’t take long for your dog to pick up where you left off and they often benefit from a break in training much in the same way we do. 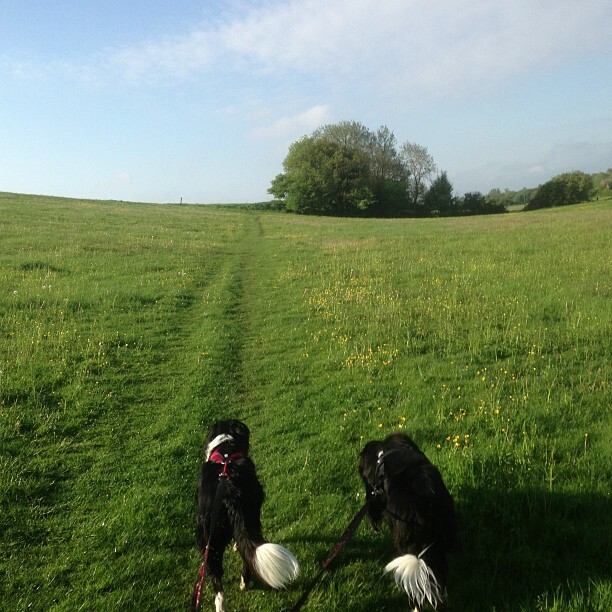 My personal canicrossing ‘cut off’ rule is not very technical but I find it works for us – if I wouldn’t be comfortable going for a run in a long sleeved top with long sleeved running tights on, then it’s too hot for my dogs. If in doubt – don’t run! This race report is a little late as the event was on the 19th May but I was hoping for some professional pictures which I unfortunately don’t have. The end of season race in the CaniX championship has, for the past 4 years I have attended it, been held at Cheltenham racecourse which is just down the road from K9 Trail Time HQ. However I believe this was the last time it will be held here as the building is being re-designed. 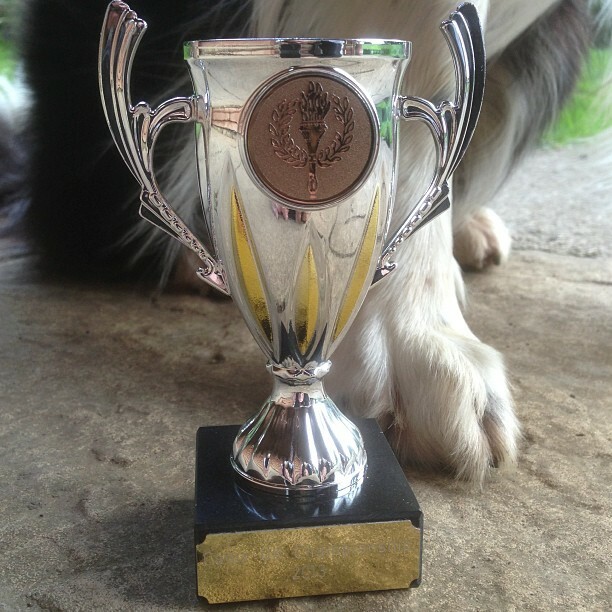 The Cheltenham CaniX event is always well attended, due more to the fact the prizes are given out for the seasons Champions than the course itself is particularly fun to run. The 5km is set up of an outer loop around the course and an inner loop with an overlap on the furthest side of the course from the stands. Most of the course is on wood chip, tarmac or sand with some grassy areas and you can also run on the grass on the edge of the tarmac roads too. The course is all open with no trees or shelter from the elements and so is prone to being too hot at this time of the year for the dogs to really race. This year was no exception and although the start time was brought forward it was still rather warm for the dogs to be running in. As always there were additional water points on the course and people were given the option to run without their dogs but most of us chose to run with our dogs but not race. 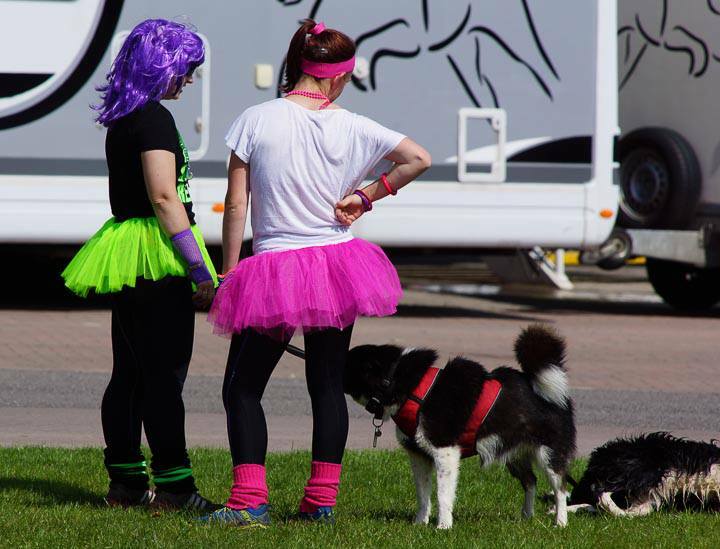 It is a bit of a tradition for competitors to wear fancy dress for the last race of the season too, so we chose this year to canicross 80’s style! The course is fairly flat but with a few gentle slopes and is perfect for the beginner canicrosser, so it’s ironic that it’s the last race of the season. We completed it one of our slowest times ever for a 5km course which was due to our frequent water stops and the fact I had to hold my purple wig on most of the way round! After the race I think everyone managed to enjoy the sun and the refreshments provided by a local caterer before the days’ prize giving and of course the main Championship results prize giving. This year CSJ were the main sponsor again and their year’s supply of dog food lasted us well into 2013 for all 3 dogs from winning the Female Scooter Championship for the 2011/2012 season last year. This year we managed 3rd place in the Female Bikejor Championship (out of 28) which I was really proud of as it was our first full season of bikejor and some of the races were particularly tough. We also managed 6th in the Female 2 dog Championship (out of 34) which just goes to show if you put the hard work and training in, then anyone can achieve great things with their dogs. I am particularly proud of our achievements this season, as I have ongoing issues with the injuries to my ankle ligaments in both legs and training last year was particularly tough because I spent most of my time falling over in the mud! It was one of the wettest autumns we have ever had and what seemed like 6 months of mud and rain took it’s toll on my ability to train. The highlight of the season for me was the European Canicross Federation Championships and picking up a European ranking of 11th for Bikejor and 29th for Female Canicross (in a very competitive field!). I’m not sure what next season will hold for us as there are lots of changes within the sport but I’m hoping that Europe beckons for Team Thomas and with the dogs passported and ready to go – who knows?! Our Bikejor Championship Trophy has pride of place in our house! I’m often being asked by new canicrossers what length of line they should buy, as K9 Trail Time stocks a wide range of bungee lines in a variety of lengths. The reason that we offer so many choices is because everyone prefers different things and as with everything, what suits one person and their dog will not suit another. For example I have always preferred to run my dogs with a slightly shorter two dog line than the average and have opted for the Bono two dog canicross line for racing two dogs. The line is made of tough webbing, it has a grab handle so you can hold them if need be and it’s a good length for racing, not being too long as to cause issues with tripping other people on the course. The Bono two dog line is approx 2 metres stretched. I have also been using the Arctic Wolf Canicross Line for running and racing one dog events because it’s extremely lightweight and being 2 metres when stretched, it meets all UK and European racing standards. When the rules about running dogs at Parkrun changed I decided to investigate a much shorter line and that was when we started stocking the Bonos’ line, which is the shortest line available at approximately 1.2 metres. I now use this line frequently with my dogs because it has a handy grab handle and is much easier to keep your dog under control in a crowded situation. That is the biggest advantage of a short line and whilst I don’t think it’s ideal for racing, as you need to allow your dog to be out in front, the Bonos’ line is certainly the best length for crowded situations and where you need to keep your dog close to you. I also use the Bonos’ line now with my husky cross, as she prefers to run by my side the majority of the time and with a longer line this can mean it drags on the floor and has even been known to trip me up! The Arctic Wolf line as mentioned before also comes in a Parkrun length and a new release for 2016 is the Non-stop Park Run Line which is also a much shorter length, designed for when you need that extra control. The Non-stop Line has been developed over the last few years and now has elastic bungee the entire length of the line, making it one of the best bungees available and is particularly good for strong pullers. The longer lines allow the dogs more freedom when we’re training to run to the side of the track and sniff at patches of grass, giving them the option to behave more like they are on a normal walk than a run. I like to make sure that my dogs aren’t always racing in harness and can differentiate between when we should be focused for racing and when we are either doing a longer distance run or are simply having a ‘fun’ run! 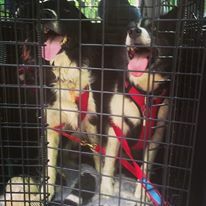 If you’re looking to bike or scooter with your dog, we would always recommend a longer line so that your dog is further away from your bike or scooter wheel and the Arctic Wolf, Non-stop and Neewa lines all have specific longer lines for this purpose, all you need to do is select the long length in the drop down options. So you can see that the different lengths of lines suit different situations and it comes down to a variety of factors to determine which length will suit you and your dog best the majority of the time.